This morning before church started, a dear lady commented, "Not that I'm counting or anything, but do we need to take up a collection to buy you some new shirts? That's the third Sunday in a row you've worn that same green shirt!" REALLY??!!?? Okay, so I like green. I think from now on I'm going to wear a different green shirt every Sunday morning, kind of in the same manner that Bill Cosby wore a different ugly sweater every week on The Cosby Show. My neighbor Sandy used to wear two different color shoes to work at her restaurant. Hey, it could be a great gimmick to increase attendance and win more people to Christ. People came from miles around to hear John the Baptist preach in camel hair. Whatever it takes, ya know? But what's really on my mind as I wrap up a very long and very rewarding day in ministry is this: Love. God is love, and He makes it very easy to love what He calls us to do for Him. Today was baptism Sunday, and what a joy it is to baptize the young and old alike. We went out to the lake on a picture-perfect Sunday afternoon to baptize seven, and ended up baptizing eight. A lady who recently lost her husband of 45 years saw what was going on and came right on out into the water asking to be baptized. What a privilege to pray for and comfort her with Christ's love. There's just no greater feeling than loving on people like Jesus taught us. The other reason that love is on my mind: My daughter. Shelby came to live with us almost 10 months ago. I first met her in my youth group when she was 11. We're not blood related, but she's been like a daughter to us for years. We opened our arms and our homes to her to give her a more stable environment. But quite honestly, it took us ten months to get it right. I had a huge learning curve, and probably wasn't the best "Dad" I could be. But this week... well, I won't go into the details. But let me urge you parents: When you honestly open up the lines of communication with your kids and let God be involved in guiding the conversation, some amazing things happen. Give your kids some credit. They're probably smarter than you realize. There's not a court order or anything "legal" that says I'm Shelby's Dad. But I have it in writing... from her. She's my daughter. So now I have two wonderful kids who both teach me daily about life in very, very different ways. They both make my heart full. I love them both unconditionally, and with all the love my heart can muster. Now. 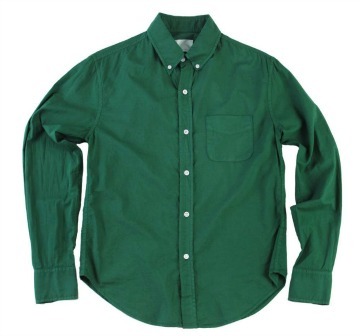 Where can I find a sale on green shirts?